If auto is selected the section classification will be calculated automatically for the stress profile corresponding to axial force and bending about major axis. Otherwise the section class can be specified by the user. Class 4 is not supported in this calculation. Note: The verifications for torsional moment Mt are not examined in this calculation. For open cross-sections torsional moment occurs primarily as warping torsional moment due to rotation compatibility. If the steel member directly supports torsional loads a closed cross-section is recommended. For standard pinned supports it is the distance between points braced along z-z direction for bending about y-y axis as a portion of the system length. For other simplified support conditions: fixed-fixed=0.5~0.65, pinned-fixed=0.7~0.8, cantilever=2.0~2.1. For standard pinned supports it is the distance between points braced along y-y direction for bending about z-z axis as a portion of the system length. For other simplified support conditions: fixed-fixed=0.5~0.65, pinned-fixed=0.7~0.8, cantilever=2.0~2.1. 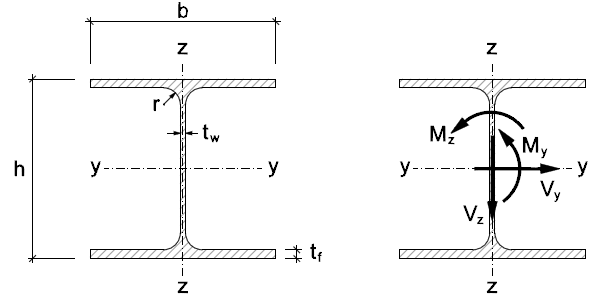 Members with open cross-section not susceptible to torsional deformations must be continuously restraint against torsion along their length. For this case torsional and lateral-torsional buckling are not verified. For standard fork supports it is the distance between points braced along y-y direction for bending about y-y axis as a portion of the system length. It is recommended to use the distance between lateral supports also for the cases where additional restraints exist as a conservative approximation. According to EN1993-1-3 §6.2.3(9) the recommended value is 1.0 for connections that provide partial restraint against torsion and warping and 0.7 for connections that provide significant restraint against torsion and warping. According to EN1993-1-1 §6.1 and the National Annex for the case of steel buildings, or the relevant parts of EN1993 for other types of structures. According to EN1993-1-1 §6.3.2.3(1) and the National Annex. A value of 0.4 corresponds to the specific method for rolled sections or equivalent welded sections (EN1993-1-1 §6.3.2.3). A value of 0.2 corresponds to the general method (EN1993-1-1 §6.3.2.2). According to EN1993-1-1 §6.3.2.3(1) and the National Annex. A value of 0.75 corresponds to the specific method for rolled sections or equivalent welded sections (EN1993-1-1 §6.3.2.3). A value of 1.0 corresponds to the general method (EN1993-1-1 §6.3.2.2). List of values given for i) rolled i-sections h/b≤2, ii) rolled i-sections h/b>2, iii) welded h/b≤2, iv) welded h/b>2, respectively. A value of b,c,c,d corresponds to the specific method for rolled sections or equivalent welded sections (EN1993-1-1 §6.3.2.3). A value of a,b,c,d corresponds to the general method (EN1993-1-1 §6.3.2.2). See National Annex for EN1993-1-1 §6.3.2.3(1). According to EN1993-1-1 §6.3.2.3(2) and the National Annex. If the option 'f=1' is specified then kc,mod = kc. Use the option 'f=1' in conjunction the appropriate values for the other parameters if lateral-torsional buckling verification according to the general method (EN1993-1-1 §6.3.2.2) is desired. According to EN1993-1-1 §6.3.3(5) and the National Annex. Method 1 corresponds to interaction factors obtained from EN1993-1-1 Annex A. Method 2 corresponds to interaction factors obtained from EN1993-1-1 Annex B. The default value ('Both methods') checks both methods and the most adverse governs. If 'Any method' is selected then both methods are checked but the most favorable is reported.